Wonderful! I admit, I'm new to copper. In my research Falk came highly recommended and the pan did not disappoint! Very informative and responsive customer service. 966 customers found this review helpful. Did you? Yes, I did! Outstanding A wonderful, versatile pan. I love the shape so much that I also purchased another size. Great for simmering large recipes A really well-sized pan that's great for large curries and such like. The conductivity of the thick copper means that simmering occurs nice and evenly without scorching. Beautifully manufactured--a real quality piece. 897 customers found this review helpful. Did you? Yes, I did! Amazing pan! An incredible pan. Absolutely perfect for so many dishes, I can't use it enough! A joy to cook in, and look at . It's not left my stove yet! 851 customers found this review helpful. Did you? Yes, I did! More than a saucier I do not know when I will be making that much sauce in my life... the 24cm saucier has a capacity of 2.7 litres. Thankfully it is so broad and tall you can probably cook many of your dishes in it and the curved sides make stirring easy. Wide bottom so it should work well in electric hobs. I try to choose different style of pots with the same diameter to share the same lid; I use the 24cm lid with the saucier, the frying pan and the casserole. 845 customers found this review helpful. Did you? Yes, I did! 5th Falk purchase This is my 5th purchase of a Falk cook pot, and I remain completely delighted with all my Falk pots! Super interior finish, nearly all one needs to do is wipe it out, and also no need to polish the copper every use- fantastic! 728 customers found this review helpful. Did you? Yes, I did! Shakshuka for breakfast my son prepared Shakshuka s bright spicy eggs, fetta and tomato dish with pita bread served on the side. This pan is perfct for it because the eggs do not stick to the pan and the size is good enough for serving 6 people: The pan is so beatiful that we just put it on the table and everyone served himself from it. 727 customers found this review helpful. Did you? Yes, I did! Pan for evening meals High quality item for every evening use. Great functioning with lid !! Quick on temperature, easy to control and to also to be used every day pan. it make cooking a please and someone to look for every day !! Steady on the stove / hob and stunning on the table. 684 customers found this review helpful. Did you? Yes, I did! Nice gift It was a gift to my mother and she liked it. Very versatile. 679 customers found this review helpful. Did you? Yes, I did! Very versatile pan This is a fantastic pan. It's a great size and shape for all sorts of different dishes. Being thick copper, it heats up very quickly and evenly. The stainless steel interior is very easy to clean with some warm water and some Barkeepers Friend. 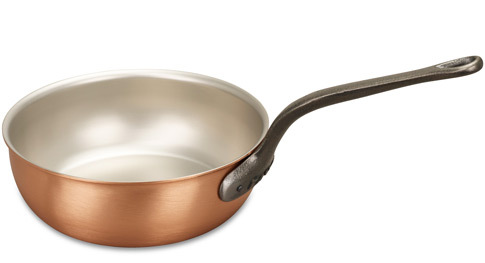 Obviously this pan is beautiful, but it is also very functional. I think it's worth buying good quality things that you use every day, especially when they are a joy to use like this pan. I am willing to bet that this pan will last the rest of my life, but unfortunately the only way I can win that bet is by dying. 674 customers found this review helpful. Did you? Yes, I did!